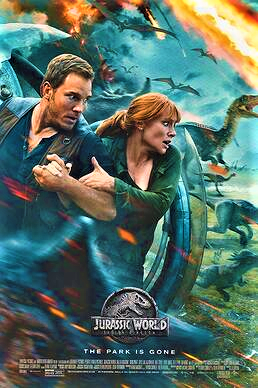 Jurassic World: Fallen Kingdom is a 2018 American science fiction adventure film and the sequel to Jurassic World (2015). Directed by J. A. Bayona, it is the fifth installment of the Jurassic Park film series, as well as the second installment of a planned Jurassic World trilogy. Chris Pratt as Owen Grady, A Navy veteran and former dinosaur trainer for Jurassic World. Bryce Dallas Howard as Claire Dearing. A PG13 Monster movie. You can see where the editors cut back the gore to keep within the classification. So while there is a lot of action, it isn’t scary, or horror. There are a lot of generic bad guy minions getting killed and eaten. There is some science fiction themes, but by the third act, it’s just evil industrialist vs the good guys. Enjoyable while it lasted, but ultimately forgettable.